Toter recently introduced two new products to its full line of organics carts, containers and bins: A 32-gallon organics caster cart and a 32-gallon organics two-wheel cart with rotationally molded lids for commercial use. Combining strength and maneuverability, this new cart was developed in response to customer demand for a broader range of organics options, Toter said. The new 32-gallon cart was designed specifically to withstand the added burden of collecting heavy, wet organic waste, while being easily able to fit in tight spaces. Manufactured with Toter’s proprietary Advanced Rotational Molding process to exceed ANSI standards (112 pounds) for strength and durability, the new cart has been load tested to withstand nearly twice the weight per gallon (200 pounds) of competitive products, ensuring years of reliable performance even in the toughest environments, Toter said. The carts also feature Rugged Rim technology, which provides extra rigidity in critical wear areas. These carts are also compatible with Toter lifters to ensure safe and easy dumping. Custom hot stamps or mold-in labels can also be added to make sorting easier. Toter said The cart is also the product of careful study of user preferences. The cart’s ideal handle height, best-in-class ergonomics, rugged wheels and casters allow for nearly effortless maneuvering, even when completely full. Organics Bins – Toter’s 2-gallon and 13-gallon organics bins allow for easy collection of organics materials. Organics Carts – Toter’s organics carts are also available in 48 and 64-gallon sizes with two wheel and optional caster wheels that eliminate the need to tip to roll, which can help prevent overexertion and workplace injuries. Organics Front End Load Containers (FELs) – Toter’s lightweight but heavy-duty plastic FELs provide a 3 times greater service life than steel containers and feature steel rod reinforcements to prevent bowing, as well a durable, single-piece lid with a trap door to keep out insects, rodents and animals. 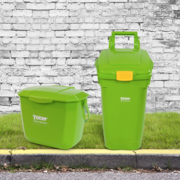 Toter is a Wastequip brand. For more information on Toter’s organics products, please visit https://try.toter.com/organics-products/. Be the first to comment on "Products news: Toter expands organics line"